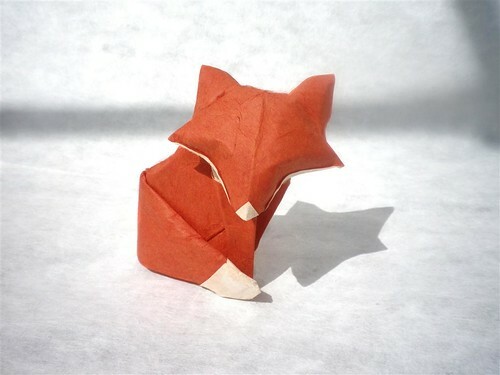 Posted in Diagrams, News, OrigamiTagged "Daniel Chang Origami", "Daniel Chang", "einfacher fux", "fox origami", "Fuchs Faltanleitung" "fox folding instruction" "fox diagram" "Fuchs Diagramm", "Fuchs Origami", "How to fold a fox", "Marc Sky" dollarartist, "mitanei Origami", "Origami artist", "Origami Frankfurt", "Origamikünstler", "simple fox", "Wie man einen Fuchs faltet", Keep Folding On, Mitanei, OrigamiBookmark the permalink. It was what I am looking for! Thank you very much. Your art is wonderful! I really love it! You are very welcome, I’m glad you like it! Love it! Does something happen to the tail between steps 22 and 23? Can’t figure it out. Thanks! The download link no longer works! I’d love to give this a go. Ich bin noch eine Anfängerin und habe diesen Fuchs heute gefaltet, es war mein erstes schwierirgers Origami, habe vorher eher so was wie Frösche Schmetterlinge, Fische gemacht. I love it! However, I have a problem with step 18. It doesn’t look like the model at all. could you please help me? upload the video or something? im addicted to fold this cute little baby fox. but i am simply stuck in step 18..
That fox is absolutely adorable! Thanks for sharing the diagrams. I think this is so cute but i am stuck 16-18 it confuses me on how it got to it. Is there a video because im more of a video person. Hi!! I really love you fox!! looks amazing! But I can’t figure it out!! Step 16, 17 &18 are really confusing, is it a way you can upload a video of your making? I think that would help a lot of people in you site so we can made you beautiful fox. Hi any chance of a video with step by step institutions please?? Reblogged this on Mèo Lười Siêu cấp.